Lethbridge College is currently accepting expressions of interest from research scientists interested in working at the College on aquaponics-­related research programs. The College has undertaken a 5 year, NSERC funded applied research program on “Advancing Commercial Food Production through Integrated Fish and Plant Systems to Meet the Needs of Industry and Community.” This research program is based out of Lethbridge College’s Aquaculture Centre of Excellence. 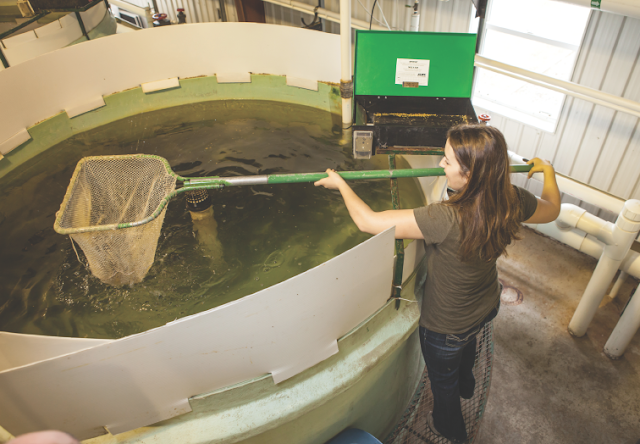 The Aquaculture Centre of Excellence (ACE) conducts research primarily dealing in the aquatic realm, particularly aquaculture, aquatic ecosystem health, water quality and fish disease. With bio­secure isolation facilities, water recirculation technologies, greenhouse operations, and water quality testing and molecular lab capabilities, ACE provides a solid base to conduct a wide variety of aquatic based research which facilitates partnerships with many private, government and non-­profit organizations. Creating and evaluating stable nutrient solutions from cold and warm water fish effluent utilizing aerobic biodigestion technologies. Optimizing the economics of balanced aquaponics systems. Developing government standards and protocols to support the commercialization of Aquaponics. Designing economic simulators for aquaponics. Encouraging mainstream support of Aquaponics by producers. We are particularly interested in hearing from scientists working on aerobic bioreactor technology and food safety/pathogen testing in aquaponics systems. Applicants must also possess a strong ability to constructively engage with aquaponics start-­ups and write successful funding proposals. Funding is available for suitable candidates.